2017 Update: read about the upgraded rust-resistant stainless steel pans! 2016 Update: read about the latest Pocket Palette 2.0, improved even more! I’m happy to announce a small update to the Pocket Palette and some new tips for using it. 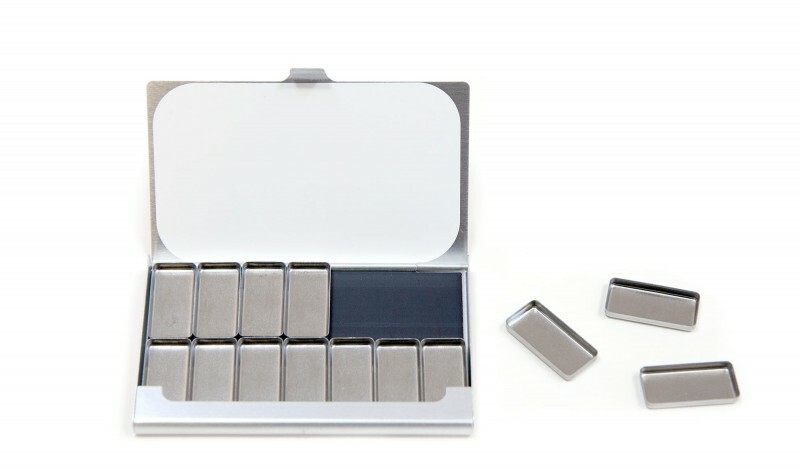 The palette now features a matte silver aluminum case that is 1 oz lighter than what I previously used! It’s snazzy, shows fewer fingerprints and scratches, and the weight savings as a traveler and backpacker is fantastic. The case is otherwise identical in form and function to what I’ve been using. If you’re setting up your Pocket Palette for the first time, fill the pans with tube watercolors and allow them to dry at least overnight into hard cakes. The dried paint can be dampened with water or a small spray bottle and will last for many sketches. 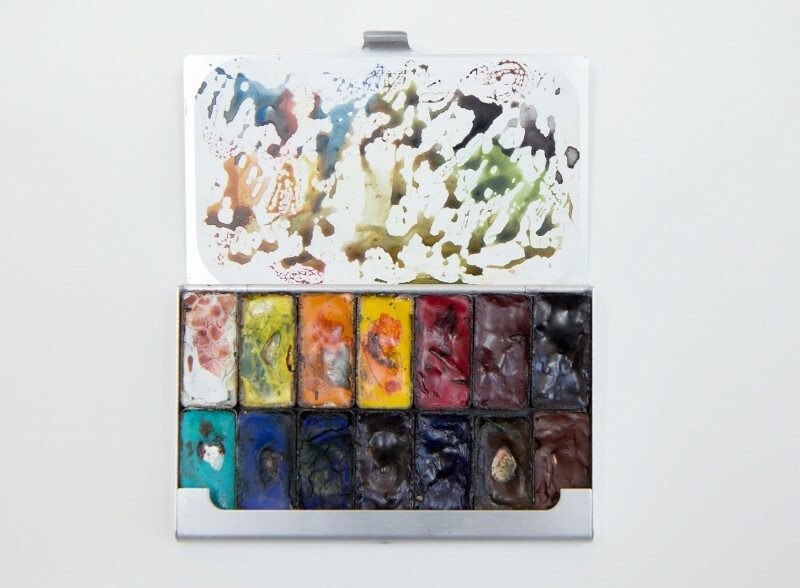 When the time comes to clean my Pocket Palette, I usually just use a waterbrush and paper towel to wipe down the mixing surface and any muddy paints. Every so often (especially before a trip), I do a more thorough cleaning. When you remove the pans, you may notice minor rust, particularly around their base. This has never been an issue for me in my own travels with the palette around the world, from the Pacific NW to Greenland and SE Asia. The pans are made of tin-plate (in contrast to the aluminum alloy palette case) and I prefer them for their magnetic responsiveness. I’ve never had to replace a pan due to its condition, and I definitely love mixing and matching the colors I carry in the palette! Here’s my palette and pans after a rinse and scrub down. I use a gentle detergent and Bon Ami to clean off paint residue and polish the pans up. Then, once the case is thoroughly dry, I condition the magnet with a light coat of olive oil. Side note: one artist was concerned about rust on her pans and passed on the tip to coat the bases with nail polish or another varnish. I’ve experimented with it and while the technique is effective, I personally don’t like the smell and don’t find it necessary. Once everything is clean, I refill any used paint and am set for my next adventure. Here’s one final tip: try using a binder clip to attach your palette to your sketchbook. Happy painting! Maria – This is a great upgrade! As a 60+ person with a bum hip, I can say that ANY weight savings is appreciated. Thanks also for the usage tips. In line with that — a while back you published a post on your warm (red/orange) and cool (blue/green) palettes, but the actual color names were a bit hard to read. Could you do a palette update post some time? Hi, Maria- just thought you’d like to know that Jacqueline Newbold posted on her blog today about the great giving potential of your pocket palette! Hopefully you’ll see a few more newbies in the next few weeks purchasing the palette! Best wishes for happy and productive painting on your Patagonia trip. I remember you from our class at the Frye last summer, and just saw an announcement of your upcoming show in the UW newsletter. Congratulations! I have your original palette, which I love & have used in NY, Alaska, SF, TX and NM now…plus have placed several orders for extra pans, in various sizes. Love them & have recommended to many people. But now that you mention it they are a bit heavy for the size & when traveling less is more, so to speak. I was wondering if there was a way to buy 1 or 2 of the new lighter palettes without any pans as an ‘upgrade’ to my existing kit. I guess I would then just use the old one for pan storage at home. Thanks! Hi Maria – my Art Toolkit just arrived – am going to fill the pans as soon as I finish this note ! I have to say I have a small kit with the plastic pans – I was using it after I had order your kit and not once but twice I managed to bump it and yes cakes and pans went flying! I am so happy my kit arrived! No more flying paint & my poor cat almost had a heart attack, she’ll be saved less of those! Love this little organiser – can I purchase it without the palette? I already have this…. But the rest looks as amazing! This is so cool! I am looking to start doing watercolors again and especially taking them with me on the go! This is a good place to start. I have briefly looked through your blog and I’m feeling both homesick for WA, but also excited to start painting again. Thanks! You’re welcome! 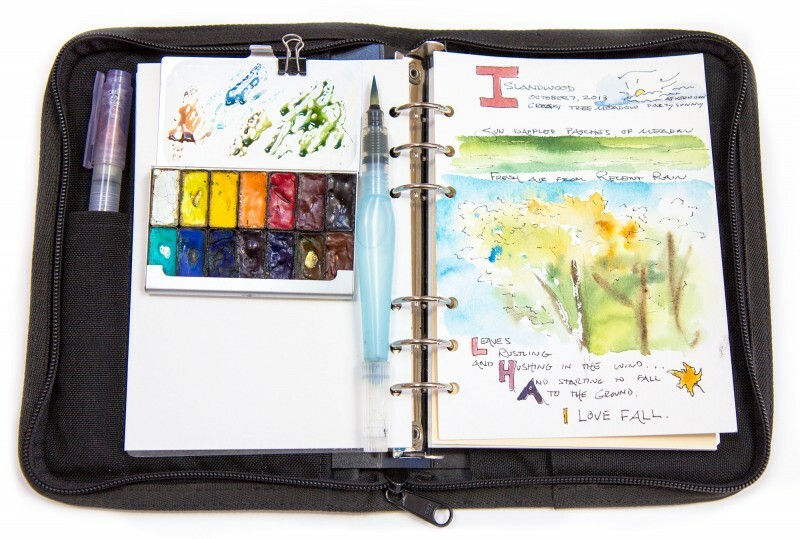 Springtime is the perfect time of year to get inspired for more field sketching. Happy painting! Is it the pocket art toolkit pictured below with the 3 binder clips? I am very new to watercolor painting, I absolutely love the look of this kit and can’t wait to purchase mine. I promised my husband I would wait till Christmas to order it, in case he decides to surprise me by getting it for me. My list has this kit and Daniel Smith paints so either way I’m going to be happy. Just ordered the palette. Can’t to get wait as it is just what I was looking for. Just started back into painting after a long break and loving it. I received my palette and pocket toolkit a week ago and I am having so much fun! 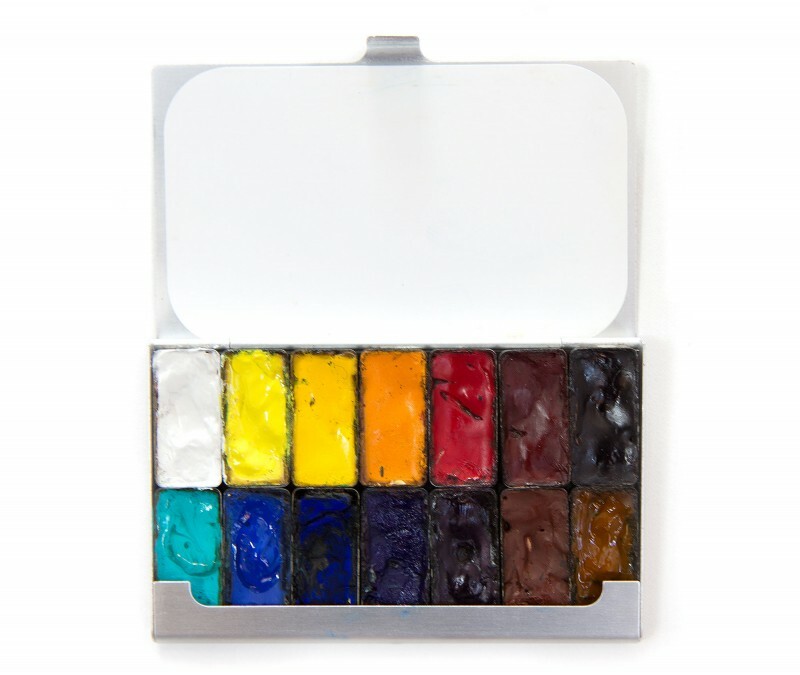 What a fantastically tiny, efficient, well made little palette which holds plenty of paint. The toolkit comes with me everywhere and I am making myself draw at least once a day, even if for 5 minutes. Thank you for helping me get the creative juices flowing again! I’m so glad you’re enjoying it! Little moments add up, way to try and sketch daily! I like how unconventional your palette is and am intrigued to try it out. But I’m a bit of a noob to watercolour (just a month in!) and I’ve been using prepared half pans so far. May I know how you transfer the paint from tubes to the pans and get them all filled up nicely, as they seem quite shallow? Do you just squeeze in the paint and push them around with your brush? Sorry if it’s a silly question! Thank you! Welcome to watercolor, Morgan! Watercolor paints are generally viscous enough that you can gentle squeeze them from the tube, from one end to the other. I might push the paint a bit into corners as I squeeze it out, and the paint will level a bit as they dry- typically overnight. Have fun! Hi Virender, I recommend using tube paints with the Pocket Palette, squeezing the pigments in and letting them dry overnight. The only type of pigments to avoid are honey-based paints (such as Sennelier) which never completely dry. I hope you enjoy your palette! Hi, the mixing section of my palette got stained! I’m using Daniel Smith watercolor. Is this normal? Is there a way to make it more stain resistant? How do I get it white again? Do you use Bon Ami on the mixing part? Is there something else I can use, Bon Ami is not available here. Hi Sylvia, some watercolor pigments are highly staining and will affect any palette. In my experience, the Phthalo blues are particularly strong and I have many palettes with a light blue tint. I do use Bon Ami to clean my palettes, I think a light dish detergent could work well, too. Something else to try would be a Mr. Clean Magic Eraser, a cleaning sponge that is typically available at hardware stores. Just came across an awesome tip for getting the mixing area of the pocket palette white again, and thought I’d pass it along: an eraser! I used a simple, white click eraser (from Walmart, or any office supply store) to erase the stains on my mixing area. It worked like a charm! I think any white eraser would would; block, click, etc. Thanks for the great tip, Wendi! I can’t wait to try it myself. I wanted to give one of these to my wife for a gift and had a question. I’m not artsy person creative person so I apologize if this is a dumb question. The little white spot on the lid where you were mixing paint… is that suitable for dry erase markers? I have no idea why or what shes doing but she has them in her tools, and I see her using them all the time while she’s painting. Hi Fred, The mixing surface is very durable, but I’m not sure how dry erase markers would behave with it. The surface is a thin plastic that works well with water media and I’ve cleaned mine with soap and Bon Ami. If your wife uses other watercolor palettes, then I believe this one would work well, too. I wish I could speak more from experience! Hello Maria! I received my order of pocket palettes in the mail today and they are incredible. My sister took a liking to them as well so here I am buying some for her. Love the product. Best regards! I’m so glad you like them! Keep in touch and I always love to see sketches or photos of Art Toolkit materials out in the world if you feel like sharing! Hi – I’m so pleased with my little palette but I’ve found that some of the (Daniel Smith) tube watercolours I’ve squirted into the pans have come loose. How do I stop them falling out? Gluing them would seem a bit odd…. Hi Christine, I have noticed some pigments crack and loosen a bit as they dry (french ultramarine from Daniel Smith is one culprit for me). To stick them back in, I sometimes add a little fresh paint at the bottom, like glue, or just use a little water to get them sticky. I hope hope that helps! 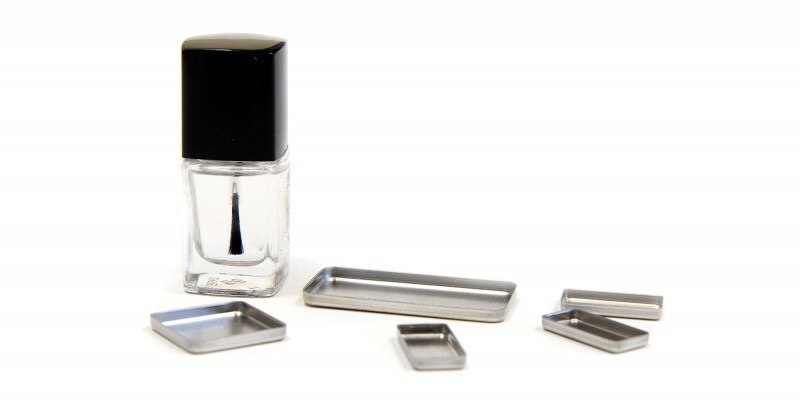 Do you know if the pans are coated with clear nail polish does it affect the magnet? Hi Maria, I just got a little palette of yours. Absolutely exquisite. Just wondering, what is Bon Ami? I live in Australia and have not heard of it, but maybe we have something similar.